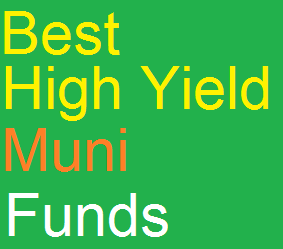 Find best performing high yield muni closed end funds 2014. Top CEF funds are Pioneer Muni High Income Advantage fund, Nuveen Muni High Income Opportunities, etc. High yield muni closed end funds use their assets to purchase lower quality rating municipal bonds. These bond funds provide tax free high yield income for investors. They usually provide the distribution yield regularly (i.e. monthly or quarterly). They have higher risk than investment grade municipal bond funds. From this best performing funds list, you may find each individual fund review. You can find the fund performance, expense ratio, and yield or dividend from the table below. The list is sorted based on its year to date performance in 2014. 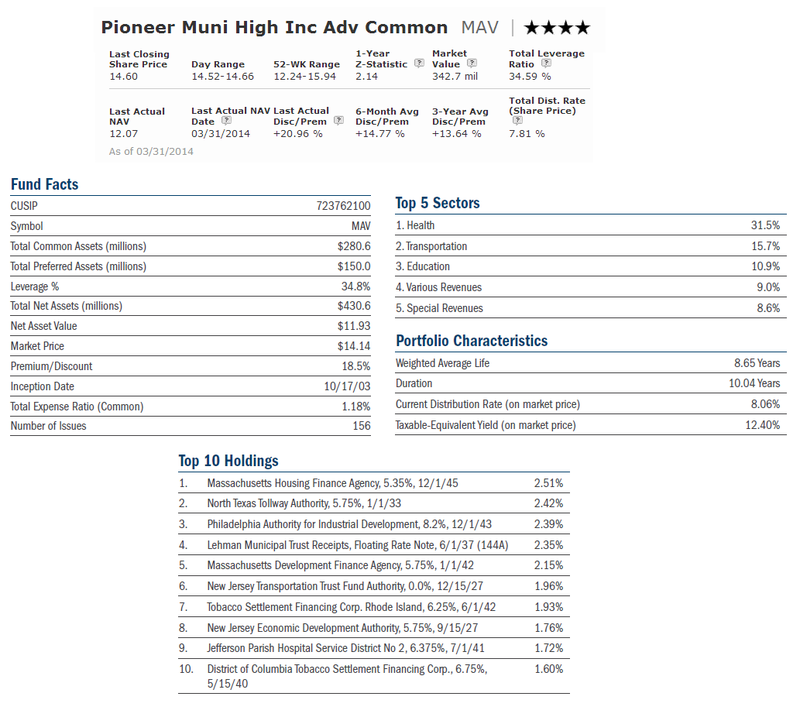 Pioneer Muni High Income Advantage fund objective is to seek high current income exempt from regular Federal income tax with capital appreciation through investment in US municipal securities. Its total net assets are $342.7 million. The current share price is $14.63. It has total expense ratio of 1.22%. The portfolio manager is David Eurkus. Morningstar analysts rank this best performing high yield muni closed end fund with 4-stars rating. This fund has a dividend yield of 7.81%. The YTD return is 16.33%. It has returned 19.71% over the past 5 year, and 7.74% over the past 10 years. The top sectors are Health (31.5%), Transportation (15.7%) and Education (10.9%). The top holdings are Massachusetts Housing Finance Agency (2.51%) and North Texas Tollway Authority (2.42%). 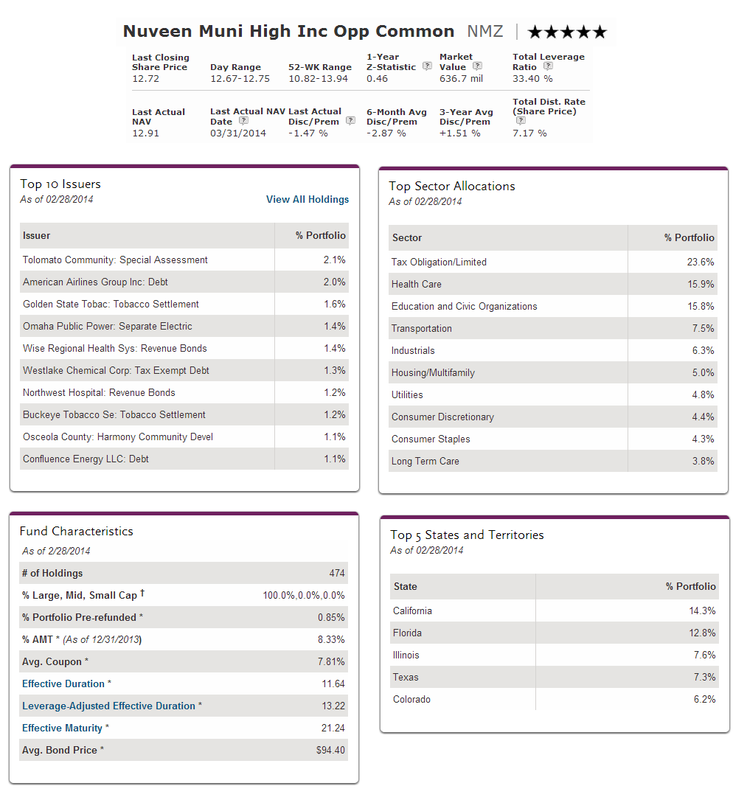 Ranked with 5-stars rating, this Nuveen Muni High Income Opportunities (NMZ) has total net assets of $636.7 million. This best performing high yield muni closed end fund has returned 10.55% over the past 3-year and 13.12% over the past 5-year. It has 7.17% dividend yield and is distributed on monthly basis. The objective is to provide high current income exempt from regular federal income tax. The CUSIP is 670682103. The top 3 holdings are Tolomato Community (2.1%), American Airlines Group Inc (2.0%) and Golden State Tobac (1.6%). It has 11.64 years of effective duration and 21.24 years of effective maturity. 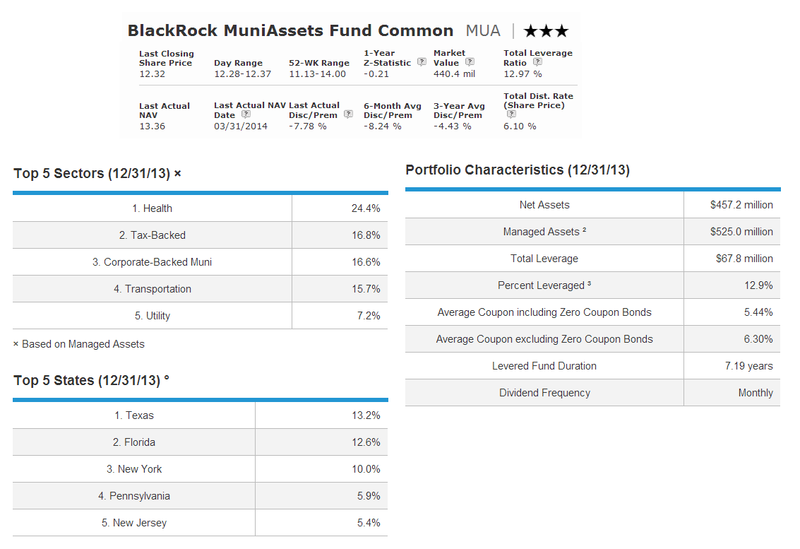 BlackRock MuniAssets Fund is currently managed by Theodore R. Jaeckel and Walter O’Connor. The fund was first incepted in 1993. The total net assets are $477.94 million. It has total annual expense ratio of 0.81% and effective leverage of 13.31%. The distribution rate is 6.09%. Morningstar has ranked this equity fund with 3 stars rating. The current share price is $12.30. The top sectors are Health (24.4%), Tax-Backed (16.8%), Corporate-Backed Muni (16.6%) and Transportation (15.7%). Texas (13.2%) and Florida (12.6%) are the top states.